A number of Shiite clerics in Bahrain’s northwestern village of Diraz are being warned against mentioning the name of the country’s highest religious authority, Sheikh Isa Qassim, during their Ashura sermons. Over the past two days, the clerics have been interrogated and threatened by the security forces and told not to include Sheikh Qassim in their prayers. Sheikh Qassim has been under house arrest for four months. 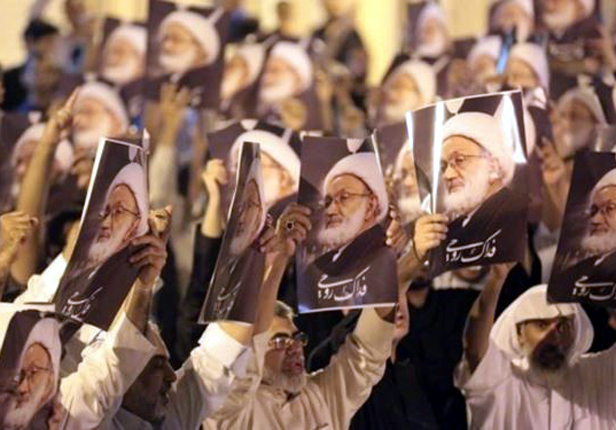 In late May, the kingdom’s security forces executed a deadly operation against the senior cleric’s supporters in Diraz, killing five and detaining hundreds of others. The bloody raid comes amid an increasingly repressive campaign targeting Bahrain’s Shiite majority and its religious freedoms. In recent days, security forces have been stepping up their crackdown against Ashura displays, removing all flags and banners associated with the Shiite occasion.